I figured that you might have some of the same questions that I've been getting asked from others, too... So I decided to write up this blog post for you! Q # 1: What will I learn during The VISIONARY METHOD? Is it for new or current business owners? That's a lot, isn't it!? Q # 2: Is it a good fit for me if I work full-time / still have a 9-5 (but am looking to leave my job or start a side hustle)? Yes! Let's get you out of that soul-sucking J-O-B ASAP! The VISIONARY METHOD will be perfect for you! Q # 3: How long is the program? It's a 90-day online course with bi-weekly modules, launched through Teachable. You can ask questions, interact with your classmates, and complete the workbooks at your own pace! Q # 4: Do you offer payment plans? Yes. You can sign up for our 12 month payment plan, which makes The VISIONARY METHOD very affordable. If you work through the modules & launch your business, you will make this money back in no time. Q # 5: What if I have questions? Contact me at hello@kelseyreidl.com or reply to this email - I'm an open book, so just ask! Q # 5: Can I read some student testimonials? Of course! I want you to hear it from THEM. Not me! When Kelsey and I first talked on our discovery call I had just sold my brick and mortar business and was looking to launch something new. I was on the fence because I already had business experience and attended so many workshops, seminars, and online classes already. I loved how authentic Kelsey was on our call and in the first few minutes of our call she gave me such great insight and support I knew I wanted to work with her. I am so glad I chose to take the leap and join The Visionary Method. This program has changed my life and moving forward I know I am a better business owner because of it. When we first began I had so many different ideas on where I wanted to go, TVM really helped me hone in and figure out exactly what I wanted to focus on and offer my clients. Kelsey’s workbooks really make you dig deep and take a look at who you are not only as a business but as an individual. By doing this everything you put out into the world is authentic and congruent to who you are. I have had coaches in my personal life but never realized how valuable having a coach would be in my business – it has pushed me to go further than I could ever go on my own. Kelsey creates a beautiful space for curiosity, inquiry, and exploration all while keeping you accountable in a gentle but no B.S. type of way. Now that I have gone through The Visionary Method I know exactly what I am focused on and I have all the tools to follow through. I am so excited for what the future holds! Kelsey is such a pleasure to work with. As someone with zero business experience, her VISIONARY METHOD program helped me gain clarity and create a vision on how to go about launching my online business and I am thankful that I signed up when I did. I enjoyed going through all the workbooks along with the audio and video training as they each were broken down into simpler steps to take away any overwhelm. Prior to signing up, I spent so much time not really gaining any traction to get the business going and instead did nothing the year before. 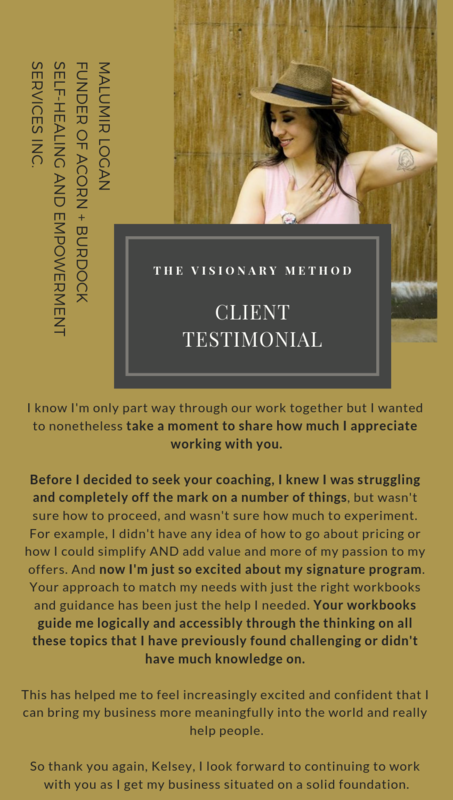 I now understand and realize that being a business owner is hard and requires a lot of work but the support that was received from Kelsey and the other entrepreneurs in the VISIONARY METHOD made the journey less daunting and scary. Even if you are just starting out like myself as an entrepreneur or looking to level up in your business, I highly recommend working with Kelsey and go through The VISIONARY METHOD. -Pamela M. Future IIN Health Coach, Wellness Advocate for doTERRA. SEE YOU IN CLASS, VISIONARY! p.s. Want to take advantage of the epic bonuses? Sign up before Saturday at 12pm EST!